Montmartre Cemetery (French: Cimetière de Montmartre) is a cemetery in the 18th arrondissement of Paris, France, that dates to the early 19th century. Officially known as the Cimitière du Nord, it is the third largest necropolis in Paris, after the Père Lachaise cemetery and the Montparnasse cemetery. 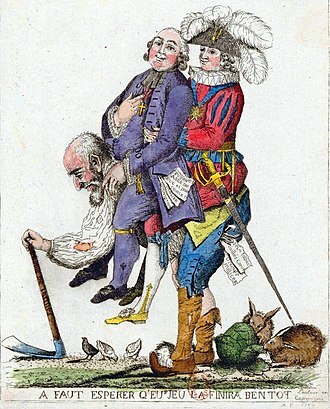 In the mid-18th century, overcrowding in the cemeteries of Paris had created numerous problems, from impossibly high funeral costs to unsanitary living conditions in the surrounding neighborhoods. In the 1780s, the Cimetière des Innocents was officially closed and citizens were banned from burying corpses within the city limits of Paris. During the early 19th century, new cemeteries were constructed outside the precincts of the capital: Montmartre in the north, Père Lachaise Cemetery in the east, Passy Cemetery in the west and Montparnasse Cemetery in the south. The Montmartre Cemetery was opened on January 1, 1825. It was initially known as la Cimetière des Grandes Carrières (Cemetery of the Large Quarries). The name referenced the cemetery's unique location, in an abandoned gypsum quarry. The quarry had previously been used during the French Revolution as a mass grave. It was built below street level, in the hollow of an abandoned gypsum quarry located west of the Butte near the beginning of Rue Caulaincourt in Place de Clichy. As is still the case today, its sole entrance was constructed on Avenue Rachel under Rue Caulaincourt. A popular tourist destination, Montmartre Cemetery is the final resting place of many famous artists who lived and worked in the Montmartre area. See the full list of notable interments below. 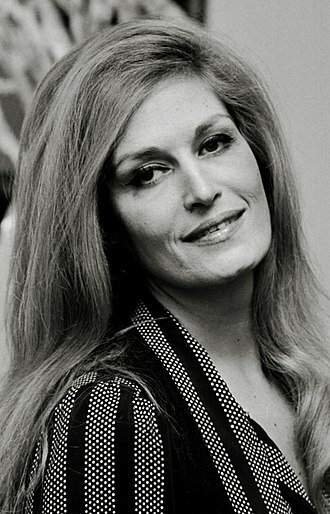 Dalida (1933–1987), Italo-French Egyptian-born singer and actress, singing diva. Renée Jeanne Falconetti (1892–1946), actress, notable for La Passion de Jeanne d'Arc. Tombstone of Vaslav Nijinsky in Cimetière de Montmartre in Paris. The statue shows Nijinsky as the puppet Petrouchka. Jean Rédélé (1922–2007), automotive pioneer, pilot and founder of the French automotive brand Alpine. Émile Zola (1840–1902), author (original site, moved to the Panthéon in 1908). The Zola family grave is still there, with Émile's name on it. ^ Waldman, Benjamin. "The Treasures of the Montmartre Cemetery". untapped cities. Retrieved 10 July 2014. ^ "Montmartre cemetery". Mairie de Paris. Archived from the original on 14 July 2014. Retrieved 10 July 2014. ^ "Ольга Иосифовна Преображенская (Olga Preobrajenska)". Belcanto.ru. 27 December 1962. Retrieved 28 February 2012. Written in Stone – Burial locations of literary figures. Henri-Georges Clouzot was a French film director and producer. He is best remembered for his work in the film genre, having directed The Wages of Fear and Les Diaboliques. Clouzot directed films, including The Mystery of Picasso. Clouzot was an fan of the cinema and, desiring a career as a writer. He was hired by producer Adolphe Osso to work in Berlin, after being fired from German studios due to his friendship with Jewish producers, Clouzot returned to France, where he spent years bedridden after contracting tuberculosis. Upon recovering, Clouzot found work in Nazi occupied France as a screenwriter for the German-owned company Continental Films, at Continental, Clouzot wrote and directed films that were very popular in France. His second film Le Corbeau drew controversy over its harsh look at provincial France, as a result of his association with Continental, Clouzot was barred by the French government from filmmaking until 1947. After the ban was lifted, Clouzot reestablished his reputation and popularity in France during the late 1940s with successful films including Quai des Orfèvres. After the release of his comedy film Miquette et sa mère, Clouzot married Véra Gibson-Amado, in the early and mid-1950s, Clouzot drew acclaim from international critics and audiences for The Wages of Fear and Les Diaboliques. Both films would serve as material for remakes decades later. After the release of La Vérité, Clouzots wife Véra died of an attack and Clouzots career suffered due to depression, illness. Clouzots career became less active in years, limited to a few television documentaries. Clouzot wrote several unused scripts in the 1970s and died in Paris in 1977, Henri-Georges Clouzot was born in Niort, France, to mother Suzanne Clouzot and father Georges Clouzout, a book store owner. He was the first of three children in a middle-class family, Clouzot showed talent by writing plays and playing piano recitals. In 1922, Clouzots fathers bookstore went bankrupt and his moved to Brest, France. In Brest, Henri-Georges Clouzot went to Naval School, but was unable to become a Naval Cadet due to his myopia, at the age of 18, Clouzot left for Paris to study political science. Charles-Valentin Alkan was a French-Jewish composer and virtuoso pianist. 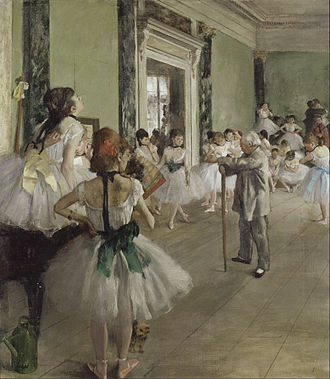 Alkan earned many awards at the Conservatoire de Paris, which he entered before he was six and his career in the salons and concert halls of Paris was marked by his occasional long withdrawals from public performance, for personal reasons. During this period he published, among other works, his collections of studies in all the major keys. The latter includes his Symphony for Solo Piano and Concerto for Solo Piano, Alkan emerged from self-imposed retirement in the 1870s to give a series of recitals that were attended by a new generation of French musicians. 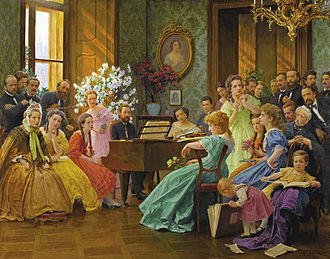 Alkans attachment to his Jewish origins is displayed both in his life and his work and he was the first composer to incorporate Jewish melodies in art music. 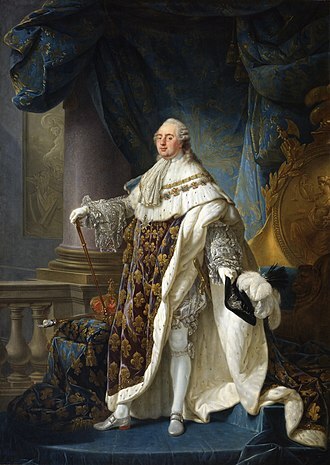 Fluent in Hebrew and Greek, he devoted time to a complete new translation of the Bible into French. This work, like many of his compositions, is now lost. Alkan never married, but his presumed son Élie-Miriam Delaborde was, like Alkan, following his death Alkans music became neglected, supported by only a few musicians including Ferruccio Busoni, Egon Petri and Kaikhosru Sorabji. From the late 1960s onwards, led by Raymond Lewenthal and Ronald Smith, many pianists have recorded his music, Alkan was born Charles-Valentin Morhange on 30 November 1813 at 1, Rue de Braque in Paris to Alkan Morhange and Julie Morhange, née Abraham. Alkan Morhange was descended from a long-established Jewish Ashkenazic community in the region of Metz, Charles-Valentin was the second of six children – one elder sister and four younger brothers, his birth certificate indicates that he was named after a neighbour who witnessed the birth. Alkan Morhange supported the family as a musician and as the proprietor of a music school in le Marais. At an early age, Charles-Valentin and his siblings adopted their fathers first name as their last. His brother Napoléon became professor of solfège at the Conservatoire, his brother Maxim had a career writing music for Parisian theatres. His brother Ernest was a professional flautist, while the youngest brother Gustave was to publish various dances for the piano and he entered the Conservatoire de Paris at an unusually early age, and studied both piano and organ. Montparnasse Cemetery is a cemetery in the Montparnasse quarter of Paris, part of the citys 14th arrondissement. Created from three farms in 1824, the cemetery at Montparnasse was originally known as Le Cimetière du Sud, cemeteries had been banned from Paris since the closure, owing to health concerns, of the Cimetière des Innocents in 1786. At the heart of the city, and today sitting in the shadow of the Eiffel Tower, is Passy Cemetery, Montparnasse Cemetery is the resting place of many of Frances intellectual and artistic elite as well as publishers and others who promoted the works of authors and artists. There are graves of foreigners who have made France their home, as well as monuments to police. The cemetery is divided by Rue Émile Richard, the small section is usually referred to as the small cemetery and the large section as the big cemetery. 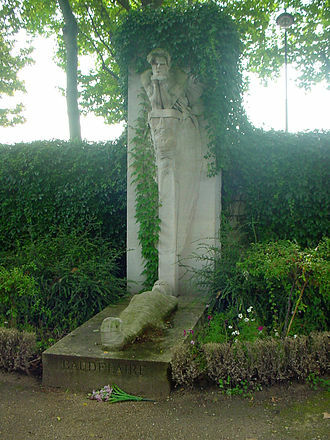 Although Baudelaire is buried in this cemetery, there is a cenotaph to him, because of the many notable people buried there, it is a highly popular tourist attraction. A Parisian-born child prodigy, Boulangers talent was apparent at the age of two, when Gabriel Fauré, a friend of the family and one of Boulangers teachers, discovered she had perfect pitch. Her parents, both of whom were musicians, encouraged their daughters musical education and her father was 77 years old when Lili was born and she became very attached to him. Her mother, Raissa Myshetskaya, was a Russian princess who married her Paris Conservatoire teacher and her grandfather Frédéric Boulanger had been a noted cellist and her grandmother Juliette a singer. 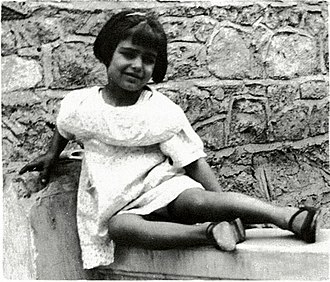 She sang and played piano, violin and harp and her teachers included Marcel Tournier and Alphonse Hasselmans. In 1912 Boulanger competed in the Prix de Rome but during her performance she collapsed from illness and she returned in 1913 at the age of 19 to win the composition prize for her Faust et Hélène, becoming the first woman composer to win the prize. Lili was greatly affected by the 1900 death of her father, many of her works touch on themes of grief and her work was noted for its colorful harmony and instrumentation and skillful text setting. Aspects of Fauré and Claude Debussy can be seen in her compositions, les sirènes is written for solo soprano and three part choir. The topic, uses a text by Charles Grandmougin, the work is dedicated to Madame Jane Engel Bathori. Bathori, a soprano, was known for her concert organisation, Bathori supported many new artists and composers. 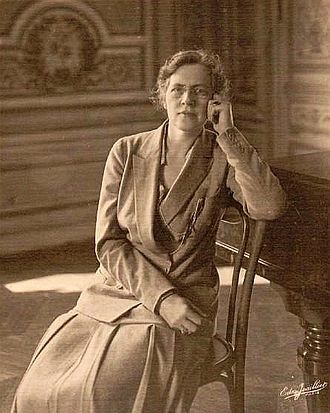 Boulanger composed three psalms, Psalms 24,129 and 130 and she composed Psalm 24, entitled La terre appartient à l’Eternel, in 1916 while she was resident in Rome. The work is dedicated to Monsieur Jules Griset, who was the director of Choral Guillot de Saint-Brice, durand published the work in 1924. The work is scored for choir, accompanied by organ and brass ensemble, Psalm 129 was composed in 1916 in Rome. This psalm is much longer than Psalm 24 and is composed for full orchestra, the premiere performance was held at the Salle Pleyel in 1921, conducted by Henri Busser. Du fond de l’abîme, is composed for voice & orchestra, Boulangers psalms convey Boulangers Catholic faith. The Holy Innocents Cemetery is a defunct cemetery in Paris that was used from the Middle Ages until the late 18th century. It was the oldest and largest cemetery in Paris and had often used for mass graves. It was closed because of overuse in 1780, and in 1786 the remaining corpses were exhumed and transported to the unused subterranean quarries near Montparnasse known as the Catacombs, the place Joachim-du-Bellay in the Les Halles district now covers the site of the cemetery. The cemetery took its name from the church of the Holy Innocents that has now disappeared. 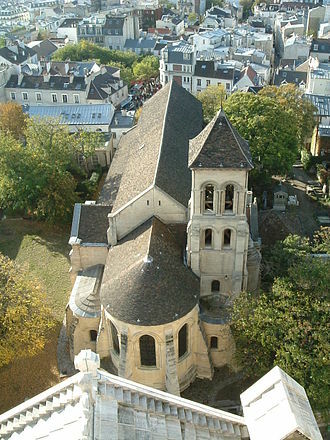 Sources describe the ground, called Champeaux, and the associated church in the 12th century. It was located next to the central market, under the reign of Philip II the cemetery was enlarged and surrounded by a three-meter-high wall. Les Innocents had begun as a cemetery with individual sepulchres, people were buried together in the same pit, only when it was full would another be opened. 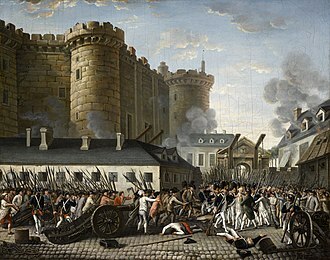 It was one of the earliest and best-known depictions of this theme and it was destroyed in 1669 when this wall was demolished to allow the narrow road behind it to be widened. In the 16th century, the prominent Renaissance anatomist Andreas Vesalius studied the bones of corpses in the Holy Innocents cemetery, two edicts by Louis XVI to move the parish cemeteries out of the city were resisted by the church, which profited from burial fees. To reduce the number of burials, the price of burials was increased, after a prolonged period of rain in spring 1780, conditions became untenable. On 4 September 1780, an edict forbade burying corpses in Les Innocents, bodies were exhumed and the bones were moved to the Catacombs in 1786. 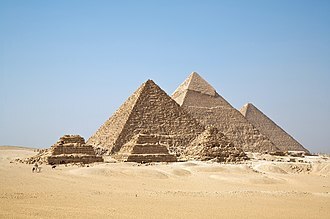 Many bodies had incompletely decomposed and had reduced into deposits of fat. During the exhumation, this fat was collected and subsequently turned into candles, the church was destroyed in 1787 and the cemetery was replaced by a herb and vegetable market. The Fountain of the Nymphs, which had erected in 1549 next to the church, was dismantled. Now known as the Fountain of Innocents, it stands on Joachim-du-Bellay Square. 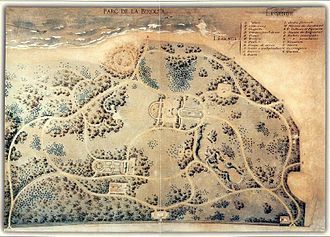 The destruction of the church and removal of the cemetery at Les Innocents is the subject of Andrew Millers Costa prize winning 2011 novel Pure, the cemetery and the Catacombs to which the remains were relocated play an important part in Barbary Hamblys novel Those Who Hunt The Night. William Didier-Pouget was a French artist, born in 1864, France, known for his landscape paintings. He focused primarily on the countryside of southern France, infusing his landscapes, always painted outdoors, with light, Didier-Pouget is associated with the phase of Impressionism, although not actually identified with the group of artists typically known as the Impressionists. 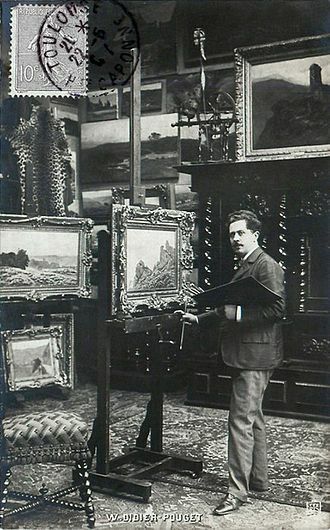 His career as an exhibiting artist stems from 1886 onwards and he was a member of the Société des Artistes Français, a member of lÉcole de Crozant and Société des Peintres de Montagne. Also, laureate of lInstitut au Concours Troyon, Officer of the order of Nichan Iftikar, William Didier-Pouget was the son of a newspaper editor. Antoine Paul Jules Edgar Pouget, a lover, encouraged William in his ambition to become an artist. The two would take long walks together, the elder pointing out natural phenomena while discussing methods of their pictorial representation. He related biographical details of the artists and present. Didier-Pouget began his art training at the École des Beaux-Arts in the city of Toulouse. He studied at the Académie de Paris with Amédée Baudit, the famed French landscape painter and he studied with Louis-Augustin Auguin, an associate of Gustave Courbet and Jean-Baptiste Corot. Ultimately, Didier-Pouget was accepted into the studio of Maxime Lalanne, under these influences many profitable years followed. The seeds were sown for what would become Didier-Pougets fruitful career as an artist, William Didier-Pouget married Caroline Salley and had a daughter, Yvonne. Yvonne Aubert-Didier-Pouget became an artist painter and miniaturist, in Toulouse, the young artist had already been regarded as a prodigy of talent, and great things were expected of him. 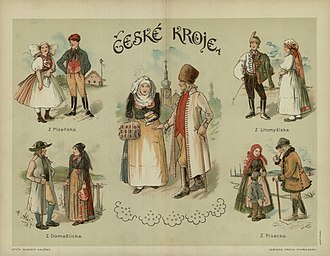 Paintings were exhibited in the provinces, attracting attention. Encouraged, Didier-Pouget sought an audience, and moved to Paris. From 1886 he exhibited regularly at the Salons, each new season showing a marked advancement in his art, bringing to the world of Paris new and delightful colour-schemes, during his early years Didier-Pougets landscape paintings were temperate and ethereal with a poetic atmosphere. Marie Duplessis was a French courtesan and mistress to a number of prominent and wealthy men. She was the inspiration for Marguerite Gautier, the character of La Dame aux Camélias by Alexandre Dumas the younger. Much of what is known about her has been derived from the literary persona, Marie Duplessis was born Alphonsine Rose Plessis in 1824 at Nonant-le-Pin, France. At the age of 15, she moved to Paris where she found work in a dress shop, as recorded in art of the day Marie Duplessis was evidently an extremely attractive young woman, with a petite figure and an enchanting smile. By the time she was 16, she had become aware that prominent men were willing to give her money in exchange for her company in both private and social settings. She became a courtesan and learned to read and write, and to stay abreast of events so as to be able to converse on these topics with her clients. She added the faux noble Du to her name, Duplessis was both a popular courtesan and the hostess of a salon, where politicians and artists gathered for stimulating conversation and socializing. She rode in the Bois de Boulogne and attended opera performances and she had her portrait painted by Édouard Viénot. Duplessis was the mistress of Alexandre Dumas, fils between September 1844 and August 1845, she is believed to have become the mistress of composer Franz Liszt, who reportedly wished to live with her. Throughout her short life, her reputation as a discreet and she remained in the good graces of many of her benefactors even after her relationships with them had ended. She was briefly married to at least one of her lovers, Marie Duplessis died of tuberculosis at the age of 23 on 3 February 1847. Her husband the comte de Perregaux and her lover the Baltic-German count Gustav Ernst von Stackelberg were by her side. Within a few weeks of her death, her belongings were auctioned off to pay her debts, her funeral in Montmartre cemetery, where her body still rests, was said to have been attended by hundreds of people. Dumas romantic novel La Dame aux Camélias was based on Duplessis and it appeared within a year of her death. Myles Byrne was a leader in the Irish Rebellion of 1798 and chef de bataillon in Napoleon’s Irish Legion. Myles Byrne was born in the townland of Ballylusk near Monaseed, County Wexford, Ireland, on 20 March 1780, after the Wexford Rebellion was over, he joined Michael Dwyer and Joseph Holt in the Wicklow Hills, continuing to fight on. While there he was involved in the Emmet Rebellion, shortly after this he escaped to France. In France he eventually became Brigadier General and leader of Napoleon’s Irish Brigade and he fought in Spain and Greece. In his years he wrote his memoirs, Memoirs of Miles Byrne and these were first published in three volumes in 1863, but there have been many subsequent reprints. ”For those areas and battles that it covers, Byrnes is the best source for the 1798 Rebellion. In Paris, Byrne frequently met many other exiled Irish - including Thomas Addis Emmet, Byrne was married in Paris to a Scots Presbyterian, Fanny Horner, but they had no children. 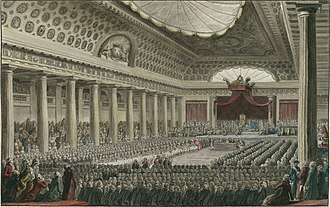 Fannys father was John Horner, a merchant of Edinburgh, and they were married on Christmas Eve,24 December 1835 in the British Embassy Chapel in Paris. She had three brothers and two sisters, One of her brothers was Francis Horner, a Whig MP, Leonard Horner, was a noted geologist. A photograph of Byrne faces page 185 in Nicholas Furlongs Fr John Murphy of Boolavogue, according to the author, it was taken in Paris in 1859 and is reputed to be the first photograph taken of an Irishman. The photograph is now in Áras an Uachtaráin, the residence of the President of Ireland, John Mitchel visited Byrne when he was 80 years old and described him as One of those rare beings who never grow old. Miles Byrne died at his house in the rue Montaigne, Paris on Friday 24 January 1862 and his grave there is marked by a Celtic Cross - but this headstone appears to be a 1950s replacement for an earlier one. The inscription to his original headstone appears in his Memoirs, in part, it read, SINCEREMENT ATTACHE A LlRLANDE SON PAYS NATAL, Miles Byrne - Memoirs of Miles Byrne. Stephen Gwynn, Memoirs of Miles Byrne - edited by his Widow,2 vols, K. Wkelan & W. Nolan, Wexford and Society. Maxime Du Camp was a French writer and photographer. Born in Paris, Du Camp was the son of a successful surgeon, after finishing college, he indulged in his strong desire for travel, thanks to his fathers assets. 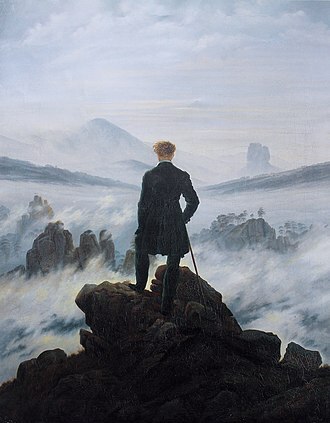 Du Camp traveled in Europe and the East between 1844 and 1845, and again between 1849 and 1851 in company with Gustave Flaubert, after his return, Du Camp wrote about his traveling experiences. Flaubert wrote about his experiences with Maxime, in 1851, Du Camp became a founder of the Revue de Paris, and a frequent contributor to the Revue des deux mondes. In 1853, he became an officer of the Legion of Honour, serving as a volunteer with Garibaldi in his 1860 conquest of the Kingdom of the Two Sicilies, Du Camp recounted his experiences in Expédition des deux Siciles. In 1870 he was nominated for the senate, but his election was frustrated by the downfall of the Empire. He was elected a member of the Académie française in 1880, mainly, it is said, on account of his history of the Commune, published under the title of Les Convulsions de Paris. Promotional photo of Iolanda for victory at Miss Egypt 1954, wearing her famous panther print bikini. Bust of Maxime Du Camp. Renée Falconetti in the movie poster for The Passion of Joan of Arc. 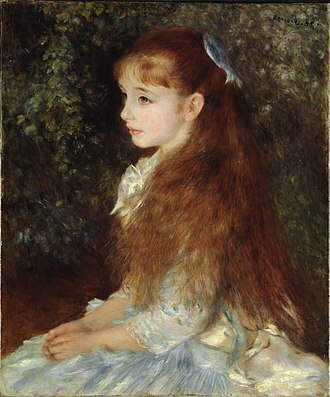 Mel Bonis at age 17, painting by Charles-Auguste Corbineau (1885). Mel Bonis at about age 50, photo ca. 1908. Lili Boulanger, source: Library of Congress. Henri-Georges Clouzot's tomb at the Montmartre Cemetery.